The Young and the Restless Spoilers: Nick and Chelsea Marry, Find Adam During Exotic Honeymoon? The Young and the Restless (Y&R) spoilers tease that Victor (Eric Braeden) will drop some bombs. Over the next few weeks, Nick (Joshua Morrow) will face some serious challenges. Victor will make sure Nick knows he made a big mistake. Nobody messes with the great Victor Newman and gets away with it! Chelsea (Melissa Claire Egan) will undoubtedly support Nick throughout the crisis. Their bond could grow stronger as Chelsea helps Nick tackle the obstacles. Although Nick is stuck a season of turbulence, he’ll likely cling to Chelsea as his pillar of stability. Perhaps Nick will make a bold move to show Chelsea just how much she means to him. The Young and the Restless never lets couples date for too long. A breakup or engagement usually happens pretty quickly on Y&R. Unless Victor pulls something catastrophic, Chelsea and Nick may remain on solid ground. Maybe that means it’s almost time for a proposal. 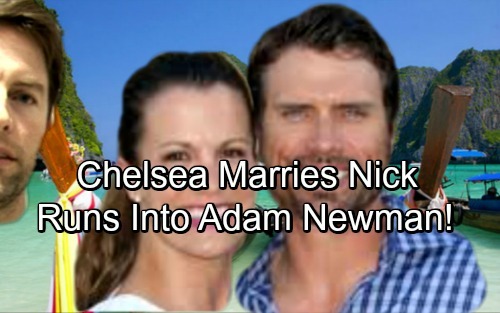 Will Nick ask Chelsea to tie the knot soon? If so, Chelsea might be a bit hesitant at first. She would naturally have Adam (Justin Hartley) on her mind. Part of Chelsea could feel guilty for moving on. This would be a great time to introduce some strange feelings. Chelsea could have a weird inkling that Adam is still alive. Of course, Chelsea would immediately dismiss the notion. She has no reason to believe that Adam is still out there somewhere. Chelsea would probably tell herself to let go and be happy with Nick. He may not be her top Newman brother, but he’s the only available one right now. Then again, The Young and the Restless might get a little more creative. Let’s say Chelsea finally decides she’s putting Adam behind her entirely. After the wedding, Nick and Chelsea could head off on their honeymoon. Could they run into Adam at some exotic location? Poor Adam may not even know who he is or how he got there. This could set up a major mystery as well as some added complications for Chelsea. She might be torn initially, but she should reunite with Adam sooner or later. Chelsea and Adam are meant to be! Would you be up for a Y&R honeymoon shocker? We’ll give you updates as other news comes in. Stay tuned and don’t forget to check CDL often for the latest Young and the Restless spoilers, updates and news. Sign up for our newsletter by clicking here and get the latest breaking soap news!